Shipowner SunStone Ships has signed their fourth shipbuilding contract on an expedition cruise ship in their Infinity series. The vessel, which will be constructed at the CMHI yard in China, is a CX103 design featuring the X-BOW® and designed by Ulstein Design & Solutions. 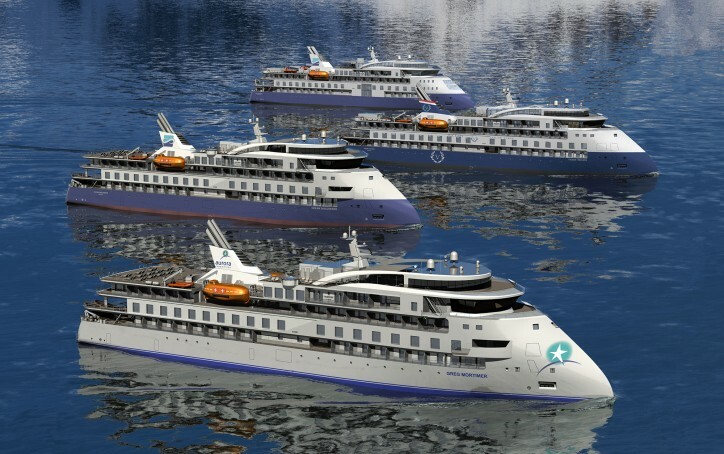 The SunStone ship design contracts were the first cruise contracts for Ulstein, a ship design company with long experience from the offshore industry. Their patented bow, the X-BOW®, has originally been developed for excellent seakeeping in rough conditions, but has also the advantage of more space in the bow areas, areas which on these vessels have been taken in use for spacious lounges with outstanding views. 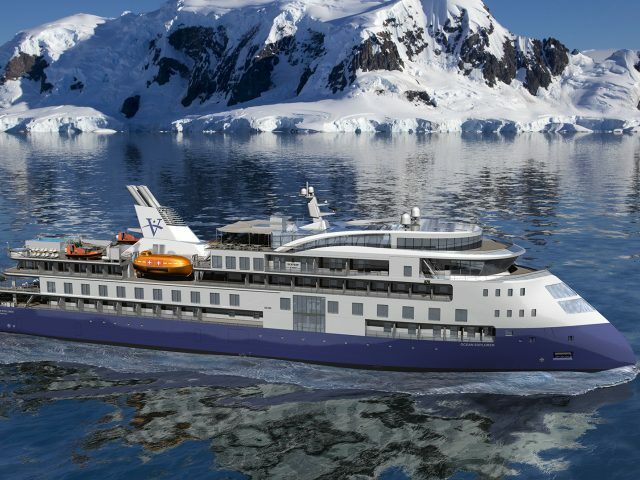 Vantage Cruise Line will be the charterer for the fourth vessel, the ‘Ocean Explorer’ (see also CruiseMapper) Planned cruises include East Asia, the Mediterranean and Scandinavia. The Infinity Class vessels are 104,4 m long and 18,4 m wide. They have a passenger capacity of 130-200, and a crew capacity of 85-115, small enough to give an exclusive atmosphere, large enough to yield all expected services and facilities, such as jacuzzi, bar and restaurant, boutique, an open-air cinema, gym and spa. The vessel harbours loads of gear for outdoor activities such as biking, kayaking or paddleboarding, and small tender boats. The Infinity class project is worldwide cooperation, with the shipowner, operator (charterer) and ship interior designer in the US, the design company is Scandinavian (Norway), and the shipbuilding is carried out in China. The first vessel in this series of potentially ten vessels, the ‘Greg Mortimer’, is in its final phase prior to her scheduled delivery in Q3 2019. Ulstein’s contract is with the yard, from left Frank Zheng – Vice General Manager of China Merchants Heavy Industry (Jiangsu) Co.,Ltd and Lars Ståle Skoge - Commercial Director at Ulstein Design & Solutions AS. 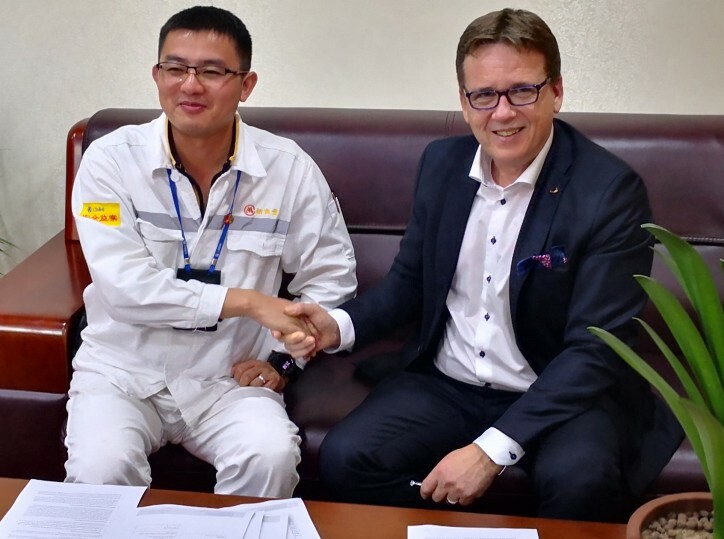 Caption: Ulstein’s contract is with the yard, from left Frank Zheng – Vice General Manager of China Merchants Heavy Industry (Jiangsu) Co.,Ltd and Lars Ståle Skoge - Commercial Director at Ulstein Design & Solutions AS.